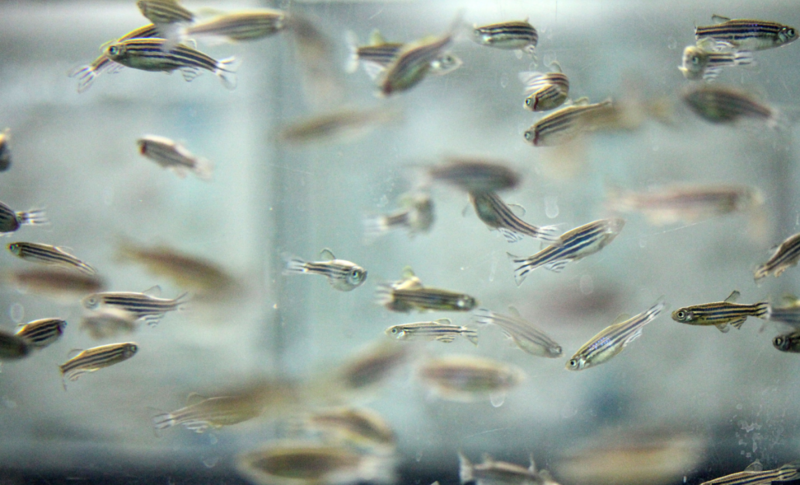 The META Center uses zebra fish to study host-microbe interaction. Four Alaska Native students got the chance over the summer to conduct research on the cutting edge of innovation at the University of Oregon. They used innovative strategies to isolate novel bacteria from fish. They explored the emerging fields of gnotobiology, live imaging, genomics and bioinformatics. They gained a holistic understanding of biology that focuses on host-microbe systems. The students were hosted by the Microbial Ecology and Theory of Animals Center for Systems Biology, a new center launched last fall at the UO with a $10.3 million grant from the National Institutes of Health. A year into the grant, culminating with a successful site visit by their external scientific advisory board on Oct. 15, the center has moved quickly to the national stage as one of just 15 National Centers for Systems Biology in the country. Working alongside groups at Harvard, MIT, Princeton and University of Chicago, the UO center is studying animal-associated microbial communities and how they assemble, interact, evolve and influence human health and diseases. The group is already making inroads in research, training and outreach. Earlier this year, META Center Director Karen Guillemin and investigator Brendan Bohannan traveled to Washington, D.C., to join in a meeting of the Institute of Medicine, an arm of the National Academies that advises decision makers and the public on national health and health-care policies. The two-day public workshop focused on microbial ecology in states of health and disease, and it addressed a new line of thinking that could bring insights for health maintenance, disease prevention and treatment approaches in humans, animals and plants. The trip came on the heels of the center’s first contribution to published research: Investigator Jessica Green was co-author of a paper for the Public Library of Science on a new approach to the formidable problem of counting and comparing the millions of microbes on and in the human body. The work moves science down the path of better extrapolating trends in diversity from microbe samples to entire communities. Green and Guillemin also helped with the center’s training component, creating an animated three-minute video lesson on microbes for TED-Ed, an initiative of the global TED conferences that focus on technology, entertainment and design. The video, narrated by Green and populated with entertaining and cartoonish microbial creatures, joins a growing video library that teachers can use to develop customized lessons. Guillemin is especially excited about the project that brought the first cohort of Alaska Native students to campus over the summer. Under the Alaska Oregon Research Training Alliance, the META Center will continue to host Alaska Native and Native American undergraduate students to work in the labs of center faculty, including Guillemin’s. Participants train in cutting-edge research in areas of microbiology, microscopy, genomics and bioinformatics, developing skills and knowledge that will serve them in any number of career paths. More than half of high school students who participate in the partnership’s parent program, the Alaska Native Science and Engineering Program, graduate with the skills necessary to pursue engineering careers, compared to 4 percent of minority students nationwide.